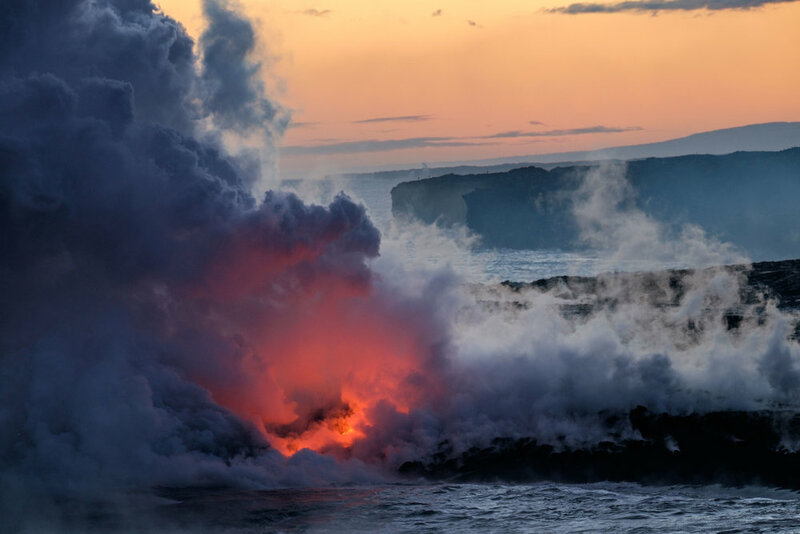 Over the course of 70 million years, lava pouring from active volcanoes in the heart of the Pacific Ocean have formed a chain of islands full of mystique and natural beauty. It is America's favorite tropical playground – a land of paradise beaches, great food, warm people, a vibrant cultural history, and spectacular scenery – and it would cease to exist without the volcanoes that grumble beneath our feet. Hawai’i Volcanoes National Park on the Big Island is the great protector of five volcanoes that gave birth to the islands themselves. Kīlauea and Mauna Loa are the two that remain active, continuously spewing molten rock which hardens to form a dynamic universe of wild terrain, tubes, caves, and fracture lines where lava flows until it reaches high ground. Across the terrestrial landscape, steam vents hiss gaseous breath from deep inside of the planet, creating an environment that feels as if it hangs in the balance between our world and another. The national park is located on the south side of the island, stretching from the shores of the Pacific Ocean to the summit of Kīlauea rising to 4,000 feet. 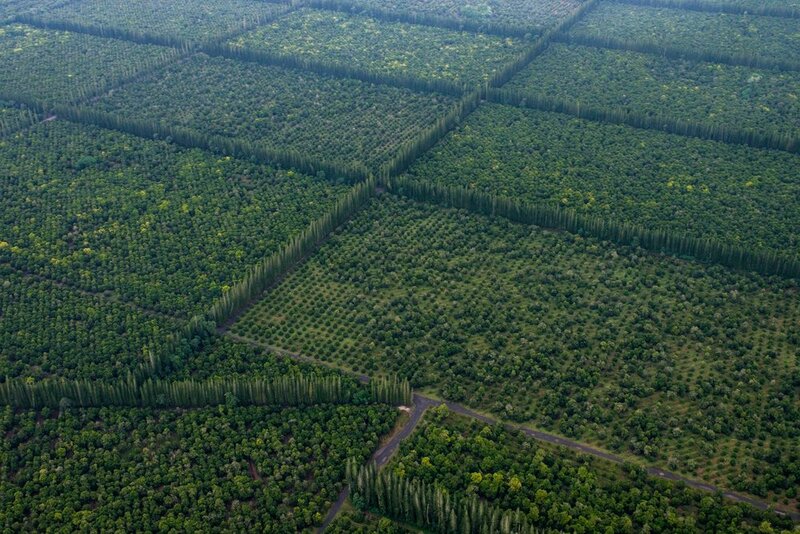 Across 333,00 acres there are endless areas to explore full of craters, desert, and tropical rainforest. This article is dedicated to highlighting some of the top spots in Volcanoes, listed in no particular order. As with every national park adventure, we recommend an immediate first stop at the visitor center to get up-to-date info on trails, eruption-related closures, a schedule of ranger-guided park activities, and of course, a report on where best to see present volcanic activity. Have fun, travel safe, get off-the-beaten-trail, and #LetHawaiiHappen – ALOHA! Chain of Craters Road winds from the high points in the park to the sea. 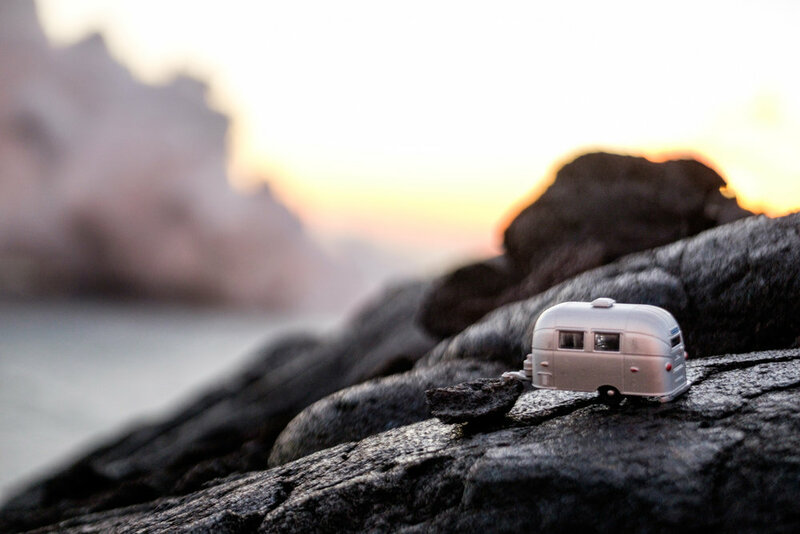 To get an introductory taste of Hawai’i Volcanoes, hop in your car and head out on an auto-expedition of Crater Rim Drive and Chain of Craters Road, the two main thoroughfares in the park. Chain of Craters Road stretches 19-miles from the Makaopuhi Crater to the Kalapana coast descending 3,700 feet. Crater Rim Drive skirts the Kilauea Caldera and passes through 11-miles of jungle and desert ecosystems. 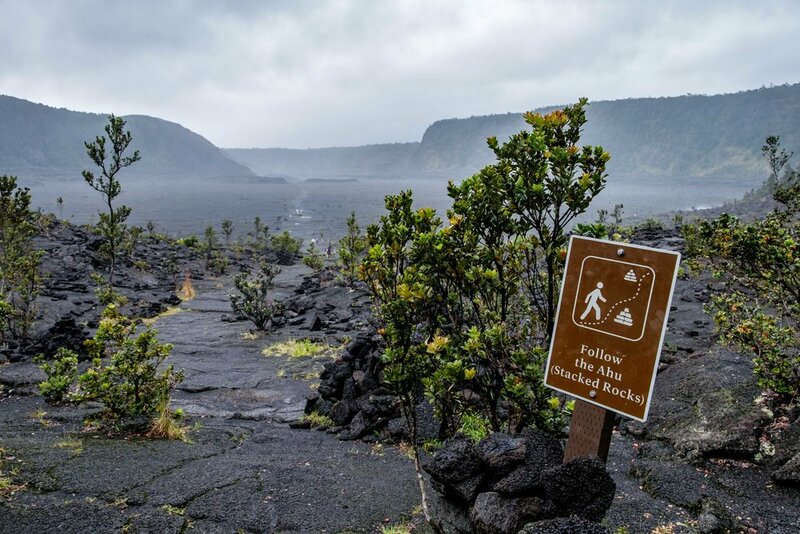 There are many viewpoints to stop at along both roads bringing you face-to-face with popular sites in the park, including the Kīlauea and Kīlauea Iki overlooks, the Ha'akulamanu crater observation deck at the Jaggar Museum, the beloved Thurston Lava Tube, and the Puʻu Puaʻi overlook. There are plenty of areas to explore on foot as well, so bring water, sunscreen, sturdy shoes, and don't forget your camera! Aside of volcanic features, jungle, desert, and sky-shows of rainbows, sunsets, wild clouds and the like, the off-road environment is a ripe habitat for families of the endangered Hawaiian goose, called Nēnē. For all things volcano related, head to the Jaggar Museum for a superb overview of Hawai'i's active volcanoes. The observation deck provides the closest proximity to an eruption point (presently about 100 feet.) There are scopes positioned on the deck allowing for magnified views and knowledgable rangers nearby (during operating hours) to explain important facts and ideas about the area. We recommend exploring the area during the day time and also at night to get a varied glimpse of Pele's masterwork. Pele, if you aren't familiar, is the mythical Hawai'ian goddess of fire, lightning, wind, and volcanoes. The main crater, Halema'uma'u, is her home. Halema'uma'u, Kīlauea's main crater during the daytime as seen from the observation deck at the Jaggar Museum. Halema'uma'u, Kīlauea's main crater at night as seen from the observation deck at the Jaggar Museum. This is one of those hikes that stops you in your tracks. 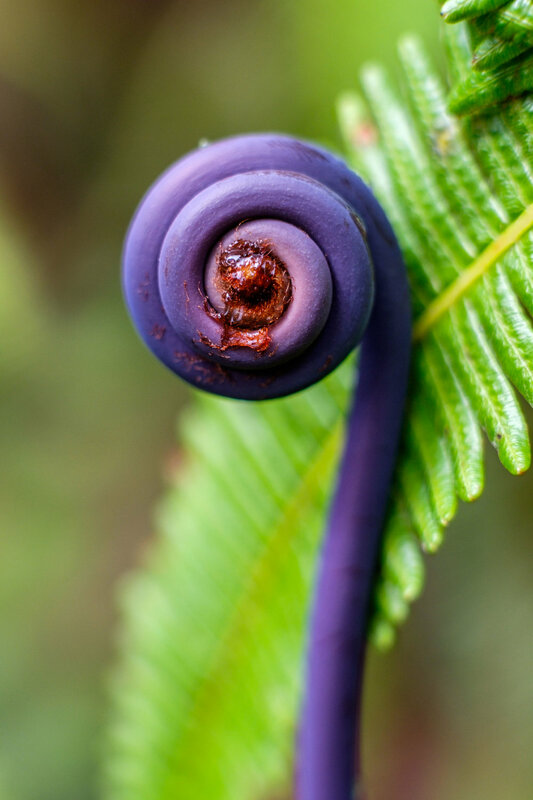 Lush tropical rainforests, native flora and fauna species, a steaming black landscape – Kīlauea Iki has it all and then some. The location is home to the Pu‘u Pua‘i cinder cone, which spewed lava 1,900 feet into the sky when it erupted in 1959 after a 90 year slumber. For five weeks, 17 episodes occurred, flooding the crater with molten rock creating a lake of lava 400-feet deep. Today, you can walk across the hardened lava bed on this awesome hike. 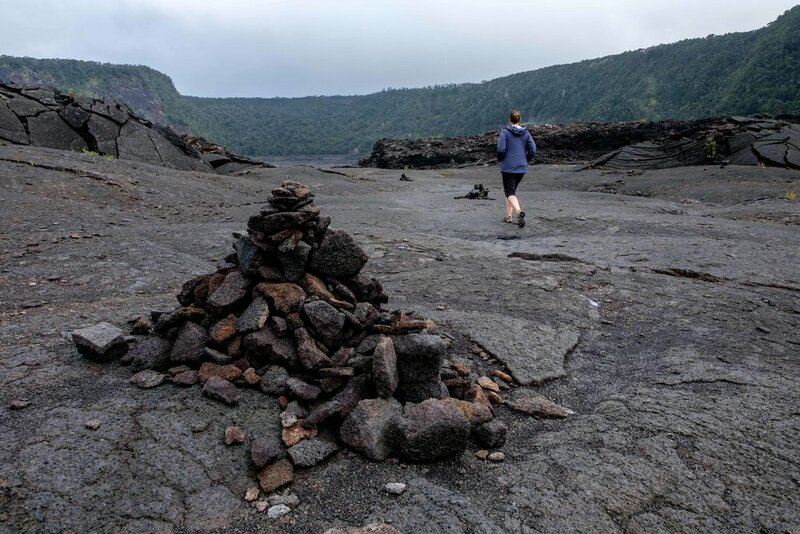 In the space of about 3 hours crossing 4 miles, you will explore a dynamic rainforest on the slopes of the crater, steam vents, cinder cones, and spatter cones on the crater floor, with ahu (cairns, or stacked rocks) guiding your way to the other side. 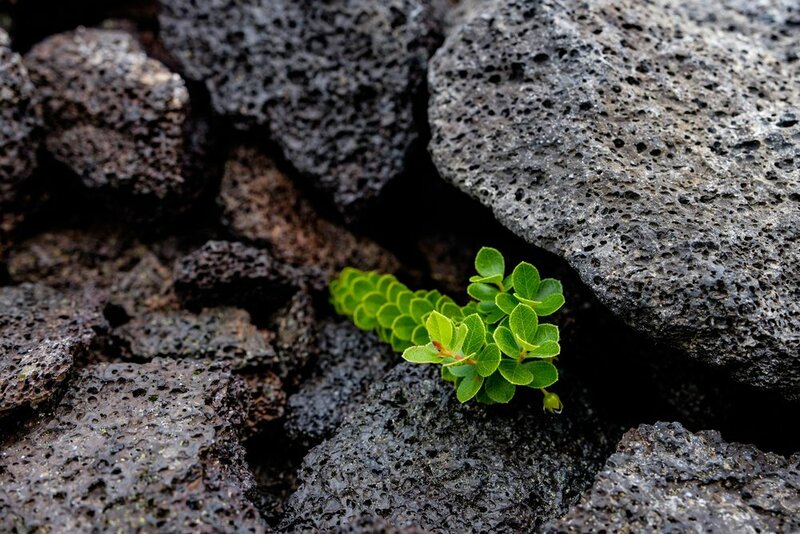 Life growing from inside the hardened lava. The Hōlei Sea Arch warmed at sunset. Sometime during the last 100 years, the Pacific Ocean revealed to the Big Island a natural sea arch formation at the end of Chain of Craters Road – a must capture photograph when visiting the park. 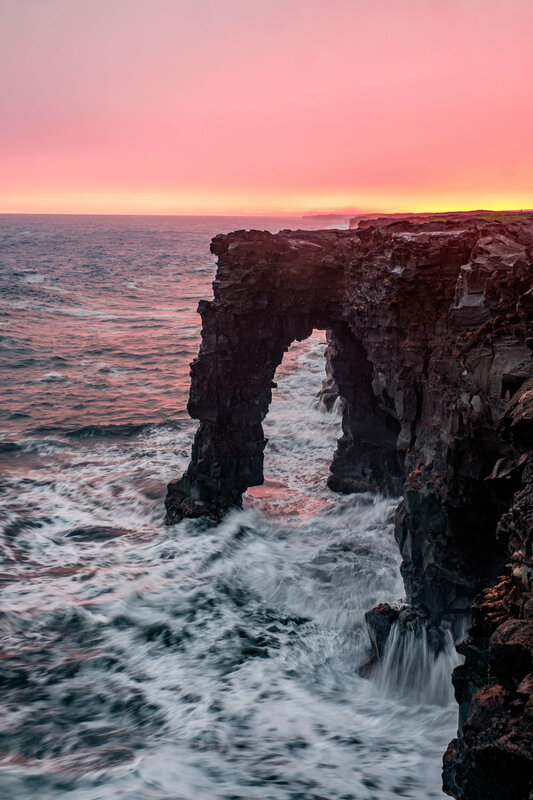 The basalt arch is estimated to be 550 years old, a gift from Kīlauea to the mighty Pacific Ocean. Standing above it can be a little unnerving (particularly for those who fear exposure) as the seawall drops 90-feet into a rocky shore. 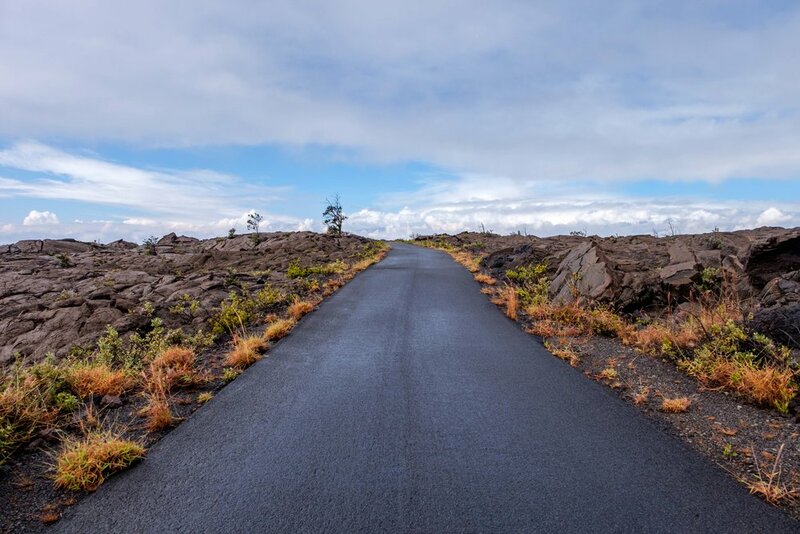 This must see stop on Chain of Craters Road is just steps away from an easily accessible parking area, and is a one-of-a-kind feature in the national park. The Thurston Lava Tube, a family favorite in Hawai’i Volcanoes, is a cave-like wonder where roaring lava once flowed with abandon. It was discovered by a newspaper man named Lorrin Thurston in 1913. When he found it, there were rare lava stalactites hanging from the low ceilings. 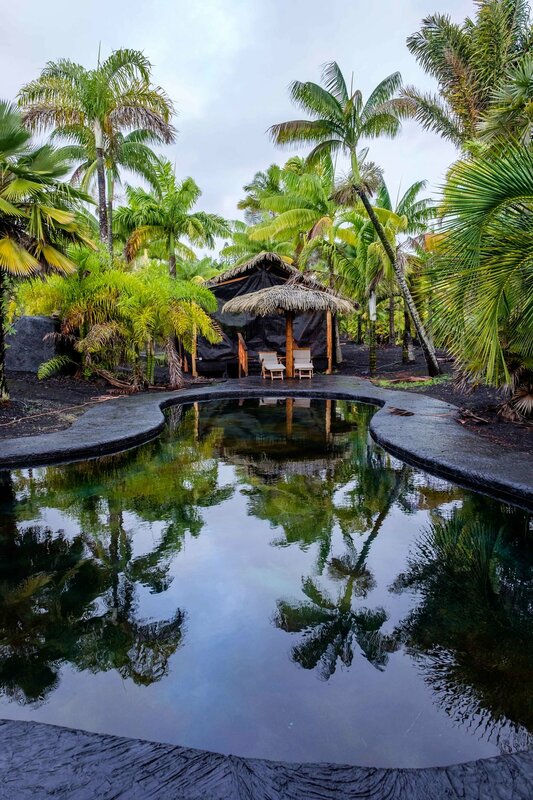 As preservation was a relatively undeveloped idea at that time, visitors removed the formations from the ceilings wishing to take a piece of the Islands home with them, not knowing the caution from Pele – "if you take lava from the islands, you will be punished by the gods!" As you make way toward the ocean on Chain of Craters Road, there is a turnoff to the Hilina Pali Overlook where you can take in sweeping panoramic views across a coastal wilderness in the heart of Volcanoes’ backcountry. The drive to the overlook from the main park road turn off is 3.5-miles each way on a one-lane road, allowing time to view a more rugged side of the Hawai'ian landscape. 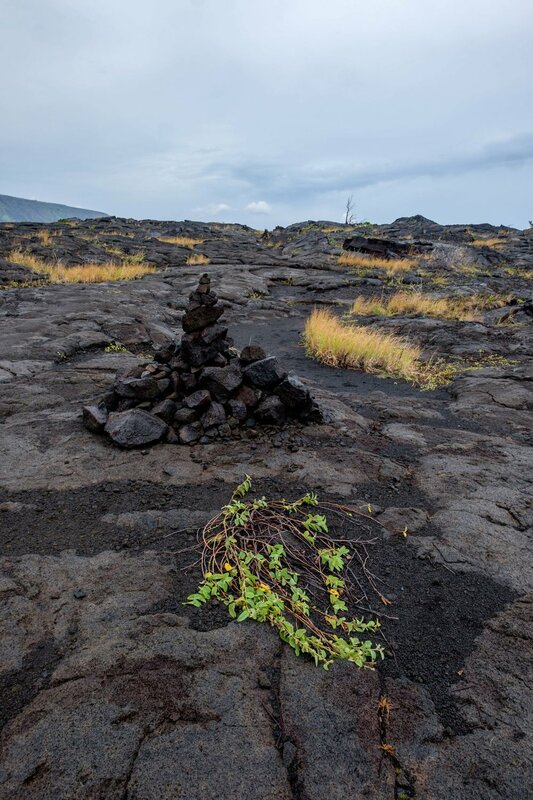 A visit to this area shows adventurers an unusual and diverse terrain passing through grasslands, arid desert, volcanic landscape, island wildflowers, and groves of ohi’a trees. This area also tends to be uncrowded which makes it that much more awesome to explore. The Hilina Pali Overlook is a cool area to explore that is away from the crowds. Check out that view! On the Islands of Hawai’i, preserving cultural heritage is one of the most important things in life, and the history is long. 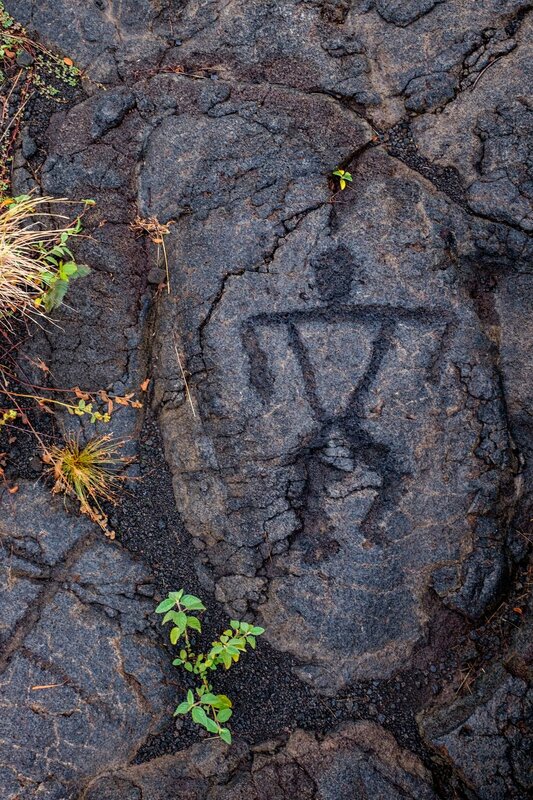 Learn more about it on a 1.5-mile round-trip hike to the Pu’u Loa Petroglyphs, a site where Hawaiian elders (kūpuna) once designed beautiful etchings depicting the lives of the native Hawaiian people – an offering to the gods in hopes of a more fruitful life. A very cool stop along the Chain of Craters Road! 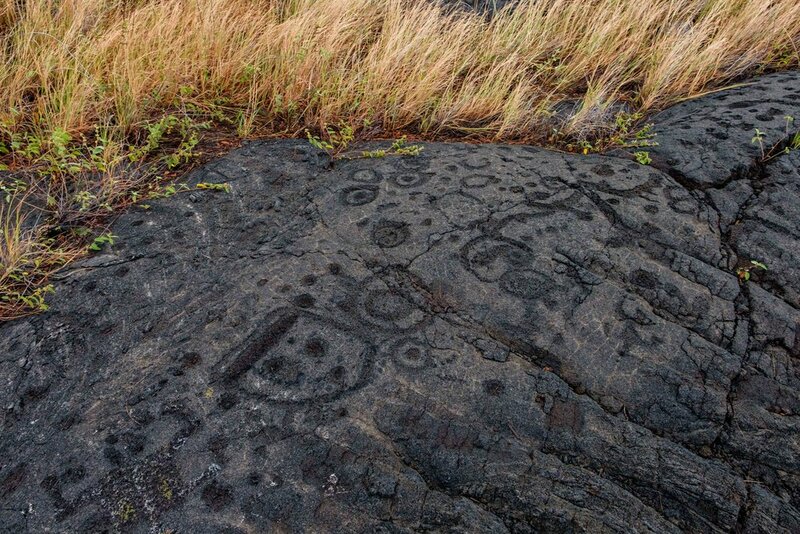 The ancient Pu’u Loa Petroglyphs. 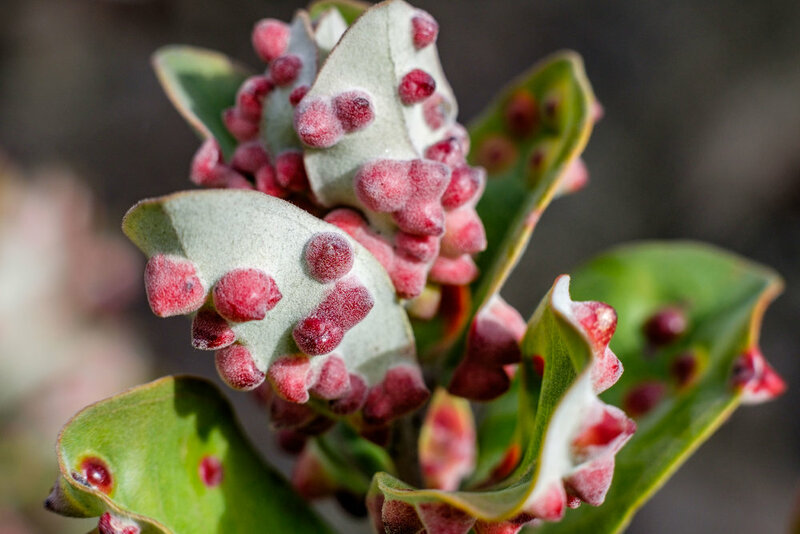 Hawai'i's ancient past with new plant growth. 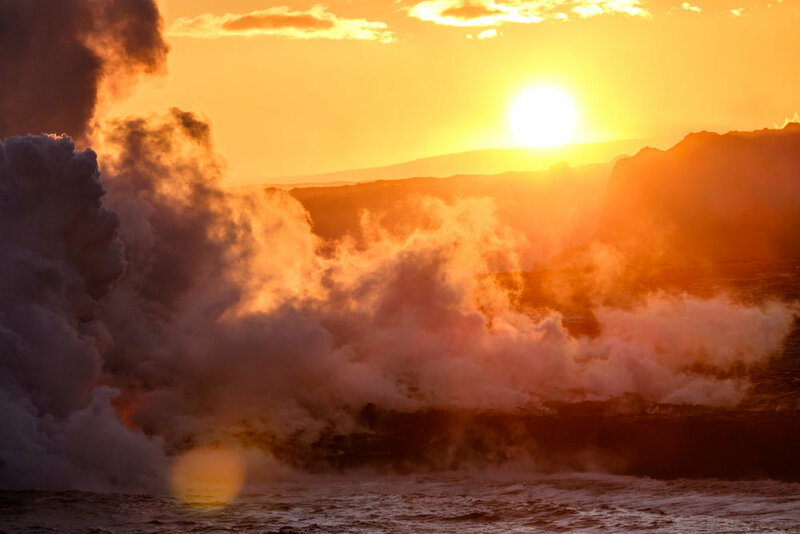 This adventure provides an unparalleled overview of Hawai'i Volcanoes National Park. Aerial views of active lava flowing from Kīlauea is a captivating site, and to see it from above with only a seatbelt between you and the bubbling Earth is unimaginably surreal and totally cool! As an added bonus, you get to see gorgeous waterfalls on the way to and from the national park. The trip starts at the Hilo International Airport, from where you will take off to explore the southern coast of the island. This doors-off adventure is harrowing indeed but if you want unobstructed photographs of the volcanic activity on the island, this is your jam. 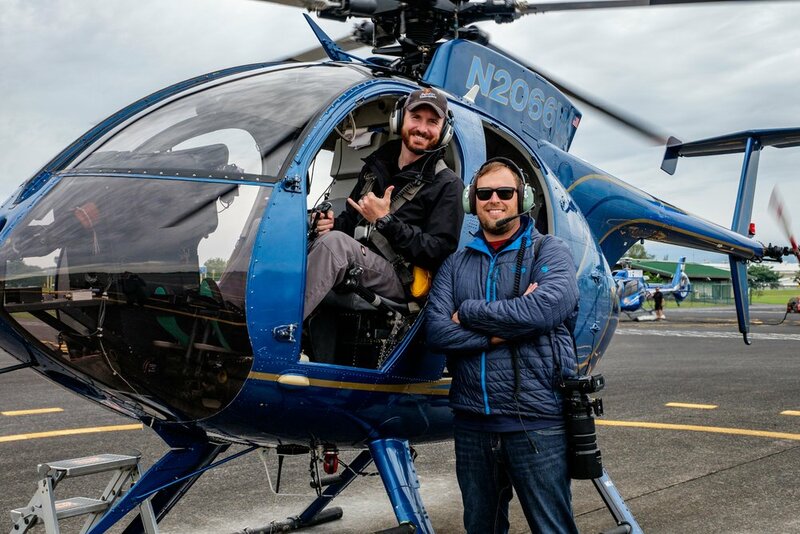 The pilots at Paradise Helicopters were true pros and also provided thoughtful interpretation along the way making it a fully immersive experience. 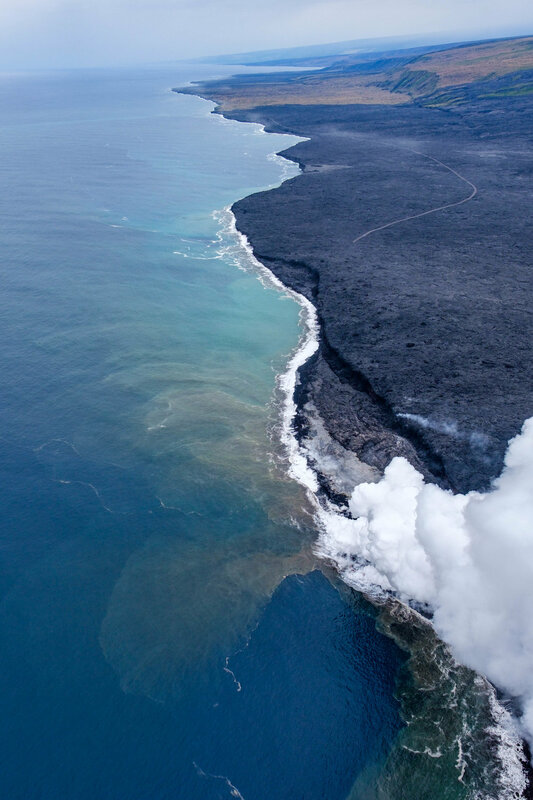 An amazing scene captured from an open-door helicopter while flying above where the Kīlauea volcano meets the largest ocean on Earth—the Pacific! 9. 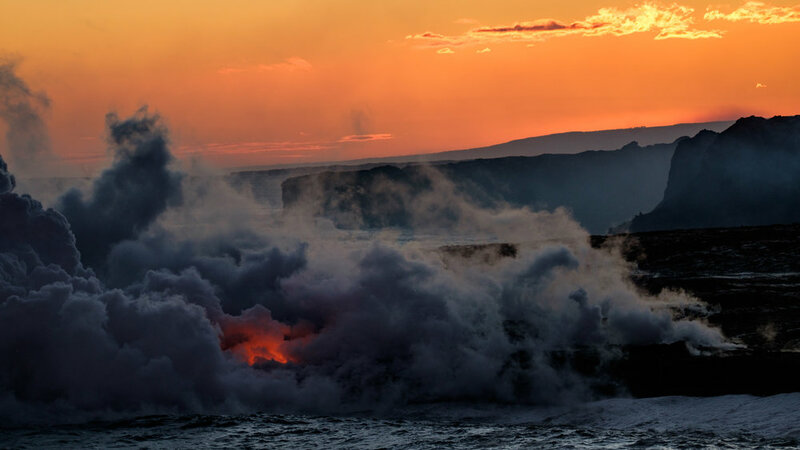 Watch the Lava Meet the Sea! At the end of Chain of Craters Road, a sublime hike awaits bringing you across an active volcano to a site where lava erupts into the sea. Crossing a hardened lava field with steam rising from its cracks is fascinating by itself, but the real reward is at the end of the 5-mile trek (one way) where you can watch the dramatic result of hot lava connecting with an icy Pacific. Enormous bursts of steam rise into the sky to meet the sunset, rainbows, interesting cloud formations, or whatever other magic is happening in the Hawai'ian sky that day. This is without a doubt one of the most unique hikes in the world – you will instantly feel the power of mother nature (and of Pele) all around you from your very first step. 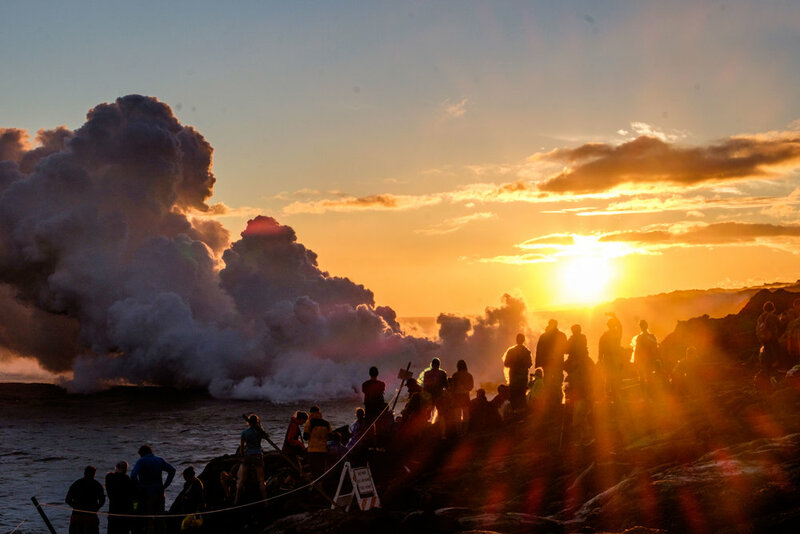 Locals, travelers, and photographers gather to watch Pele's creation meet the mighty sea. 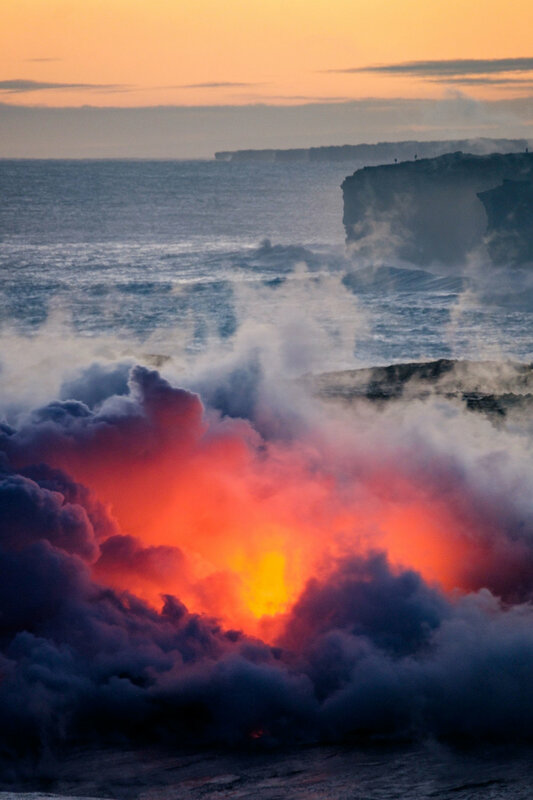 A meeting between Kīlauea and the Pacific Ocean. Lava is a result of magma – low-density molten rock that rises from Earth’s mantle melting between 40-60 miles below the planet’s crust. It follows fracture lines to the surface where it erupts. 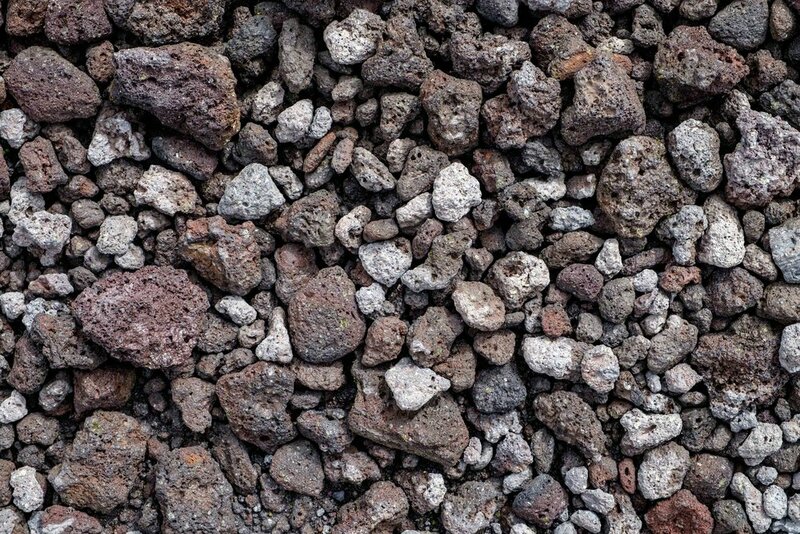 Lava is made of basalt which is comprised of 50% silica; 10% each of iron, magnesium, and calcium; 15% aluminum, and 2% each of titanium and sodium. Volcanoes is home to two of the most active volcanoes on Earth and they boast impressive stats. Mauna Loa rises to 13,677 feet above sea level and its base extends 18,000 feet below the surface of the Pacific Ocean, making it taller than Mt. Everest. With a pedestal of more than 19,000 cubic miles in volume, it is the most massive single mountain on Earth. Lava in Volcanoes National Park flows at an average rate of 800-1,300 gallons per second. 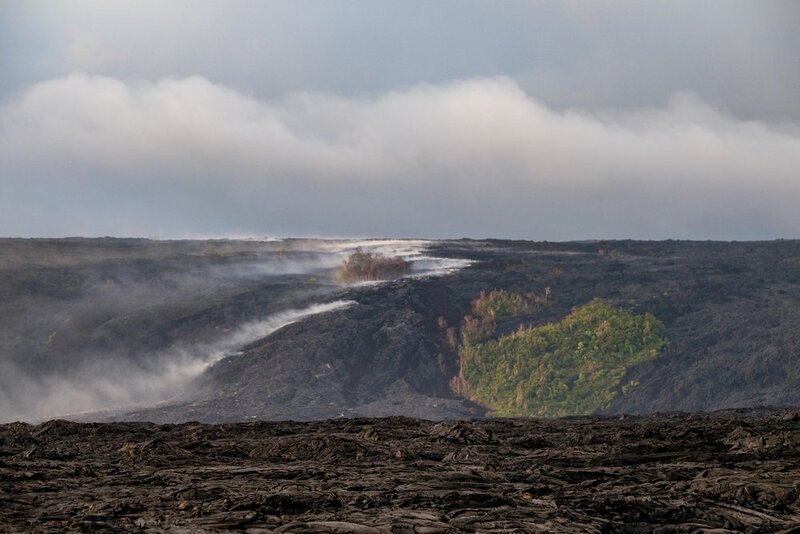 Since Kīlauea began erupting in 1983, it has added 500 acres of new land to the Big Island. 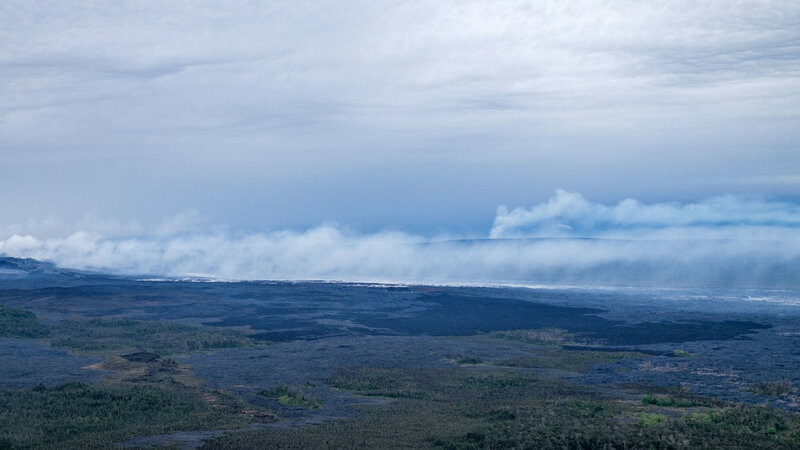 It is estimated that eruption activity on the East Rift Zone where Kīlauea is located may continue for a century or more. Volcanoes like Kīlauea will not erupt with as great of force as, say, a volcano such as Mt. St. Helens in Washington State will. Mt. St. Helens is viscous, meaning that it traps gas in the lava flow forcing explosive eruptions. 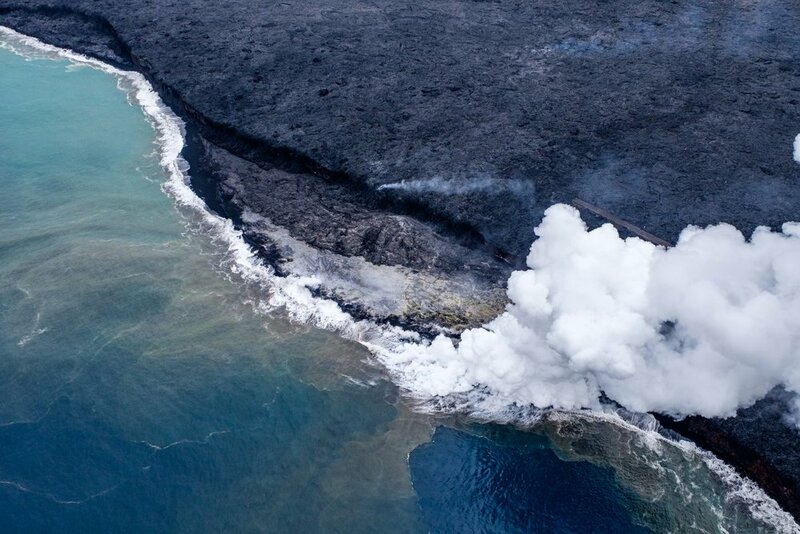 Located 15 miles from the southeastern side of Hawai'i's Big Island is Loihi, an active submarine volcano that emits geothermal and fresh lava activity. Loihi is expected to reach sea level approximately 250,000 years from now. Lava tubes are created by the movement of lava beneath the hardened surface of Earth, and can be actively draining or extinct. If you live in close proximity to an active volcano, your insurance rates are likely to rise. Interesting stuff! If you are into real estate, you might enjoy this article. Fumes from volcanic activity can be a hazard to infants, children, pregnant women, and adults with heart and/or breathing difficulties. Learn more about safety precautions by paying a visit to the visitor centers who can help ensure that your visit is a safe and enjoyable one. The Hawaii Volcano Observatory (HVO), established in 1912, is located at the historical Volcano House situated across from the Kīlauea caldera. Staffed by the U.S. Geological Survey under an agreement with the National Park Service, the organization pulls the expertise of volcanologists, seismologists, geochemists, geophysicists, and computer and electronic techs monitor and analyze seismic and volcanic activity (along with other research activities.) Their mission: As a part of the U.S. Geological Survey's Volcano Hazards Program, the Hawaiian Volcano Observatory aims to advance scientific understanding of volcanic processes and lessen the harmful impacts of volcanic activity in the volcanically active areas of Hawaii. Check out eruption activity on the HVO Cams before heading into the park to help guide your planning! How the park got its name: When dedicated, the official name of Volcanoes was "Hawai'i National Park." Then, when Haleakalā National Park on the island of Maui was established in 1961, the name was officially changed to "Hawai'i Volcanoes National Park." Iconic site in the park: The view of Halema'uma'u Crater on the Kīlauea caldera from the Jaggar Museum overlook peers onto an eruption a mere 100 feet away (and just steps away from your car!) Day views look across a panoramic of jungle as well as crater landscapes settled beneath vibrant blue skies; night views give way to explosive red magma bursting with life against a blackened night sky. In either scenario, you will experience the masterful art of Pele, the mythical goddess of fire and volcanoes. Seems like a world away from the Kīlauea Visitor Center on Crater Rim Drive located just three miles away. 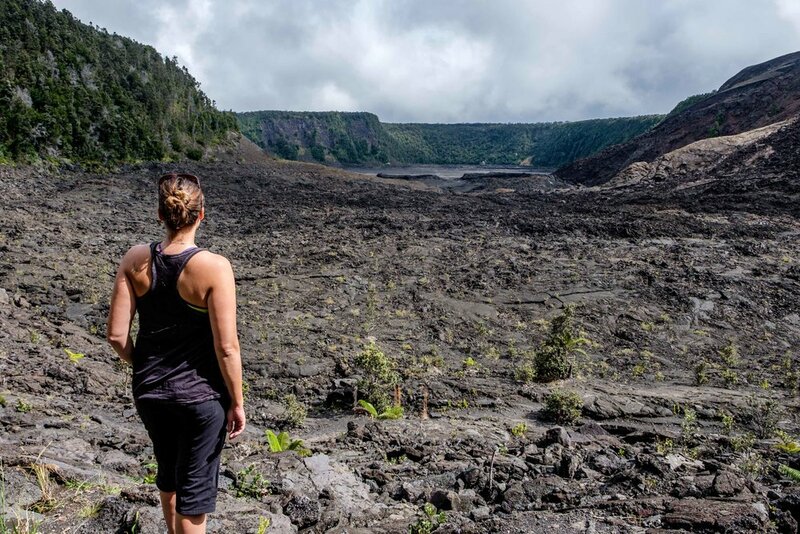 Accessible adventure: Hiking Kīlauea Iki brings day-trippers through lush Hawai’ian rainforest to a lake of hardened lava on a sprawling crater floor. 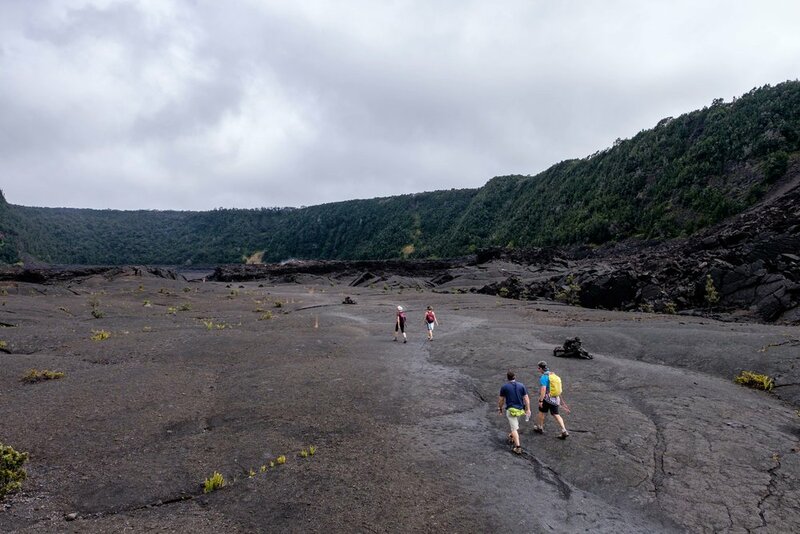 Over the course of 4-miles on a steep and rocky descent/ascent of 400 feet, you travel a well-beaten yet rugged path through a wilderness of active steam vents, unexpected vegetation, and unusual terrain along one of Volcanoes’ most beloved hikes. The hike starts at the top of the crater on Crater Rim Drive, and passes through dense vegetation while descending 400 feet to the crater floor where you will explore in awe before heading up another jungle pass on the other side, where you will find yourself just a short walk away from where you parked your car before heading in. Hawai'i Volcanoes National Park visitors watch the wonder of the Halema'uma'u Crater erupting 100 feet away. Hikers crossing the crater at Kīlauea Iki. Big adventure: At the end of the Chain of Craters Road inside of the national park, you can start the long 5-mile (one way) trek to where red-hot volcanic lava flowing from Mount Kīlauea meets the Pacific Ocean, displaying some of Pele’s finest work. The hike starts down a long fire road that eventually gives way to an expansive field of rugged volcanic terrain that has been shaped by the shifting Earth, collapse of lava tubes, and general activity occurring beneath the surface. It crosses .5-miles of paved road and 4 miles of gravel fire road before you start making way on the hardened lava to the main attraction. You can also reach the site from Kalapana, outside of the national park, which is a popular place to rent bikes and speed your way into the site in time for sunset. 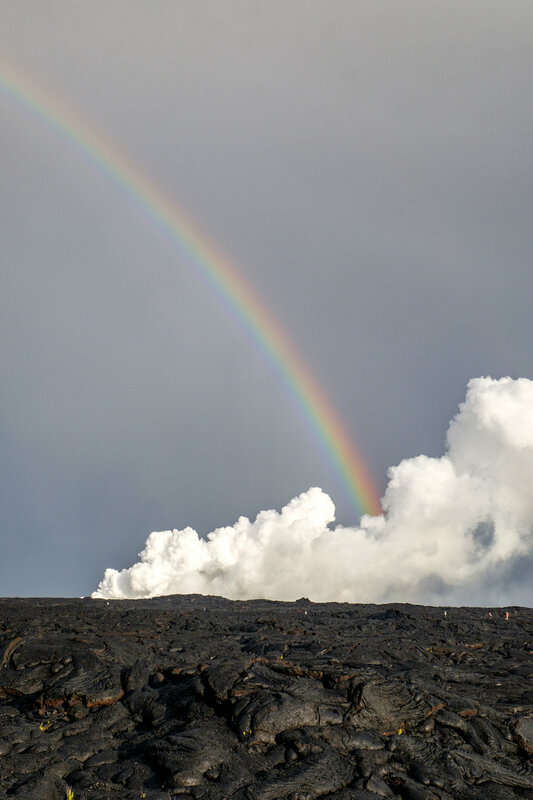 There you will find the meeting point of lava from Kīlauea and the Pacific Ocean, exploding in spectacular fashion as fire, magma, water, steam, and sky meet the effects of colorful skies... and if you are lucky, a rainbow. 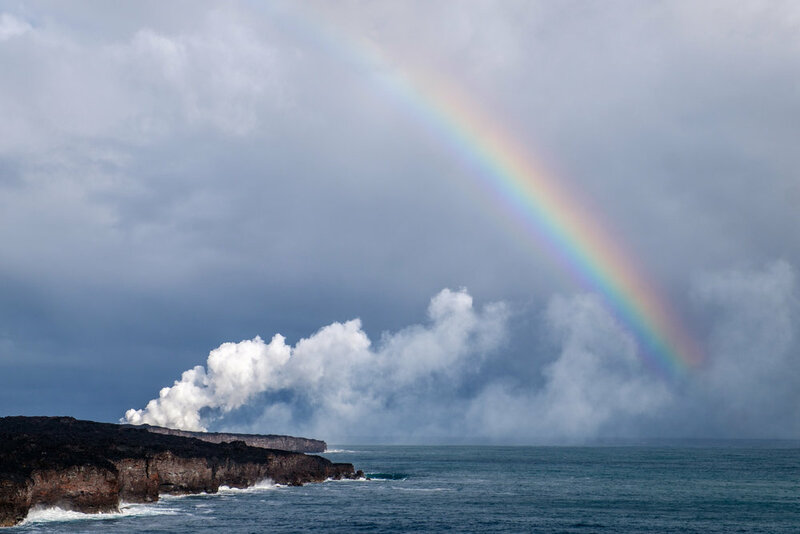 The state of Hawai’i is known as the "land of rainbows" for a reason—they pop up anywhere, at anytime in this land perpetually adorned by sun and water. Hawai’i is the southernmost state in America and is the most isolated archipelago in the world. There are seven islands that make up the Islands of Hawai’i (west to east): Niihau, Kauai, Oahu, Maui, Molokai, Lanai, Kahoolawe and the Big Island, Hawai'i. The Big Island is the youngest of the Hawai'ian Islands; Kauai is the oldest. 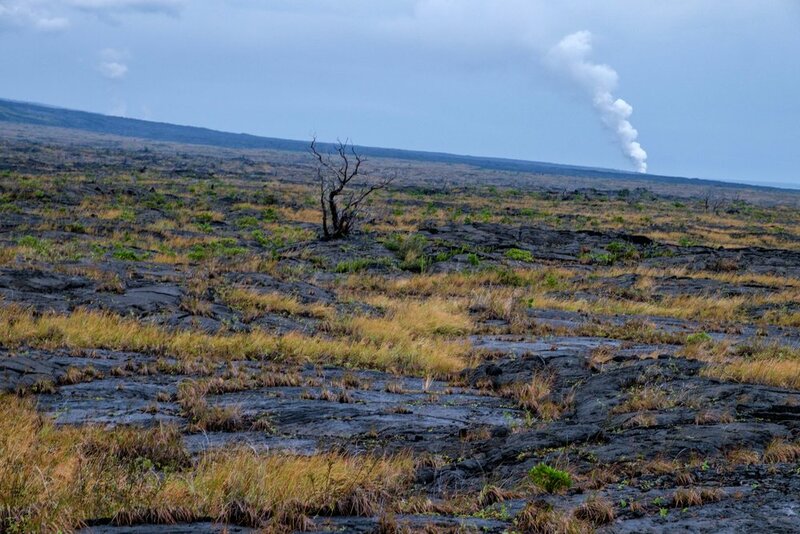 Two of the most active volcanoes on Earth – Mauna Loa and Kīlauea – are located in Hawaii Volcanoes National Park. They continue to grow every day in height and size. The Kīlauea Volcano has erupted continuously since 1983. Its name means "spreading, much spewing,” and is often referred to as “the world's only drive-in volcano." 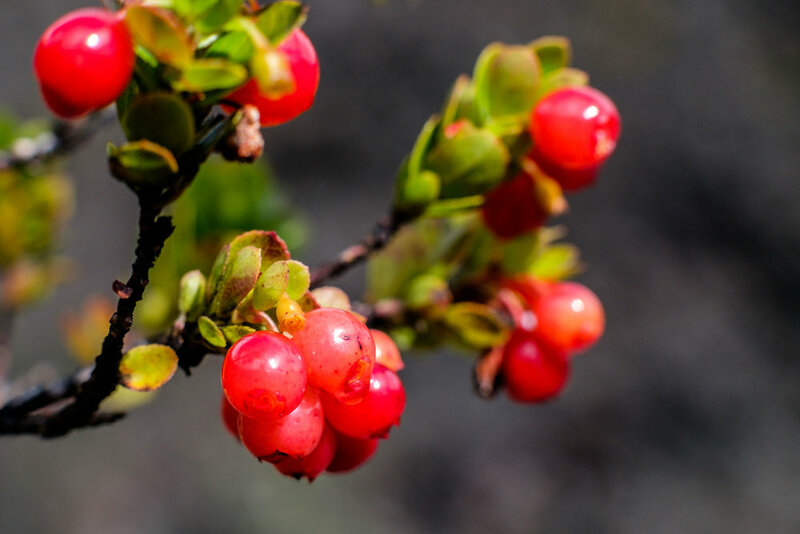 Mauna Loa translates as “long mountain.” It is a backpacker’s delight, with rugged wilderness area to explore on trails carved out by ancient lava flow. No flip flops on the lava flow! Hardened lava is as sharp as broken glass. Best to lace up sturdy shoes when venturing out on park hikes and strap those flip flops to your backpack for the end of your hike! Great respect should always be paid on the islands at burial grounds and at sacred sites. 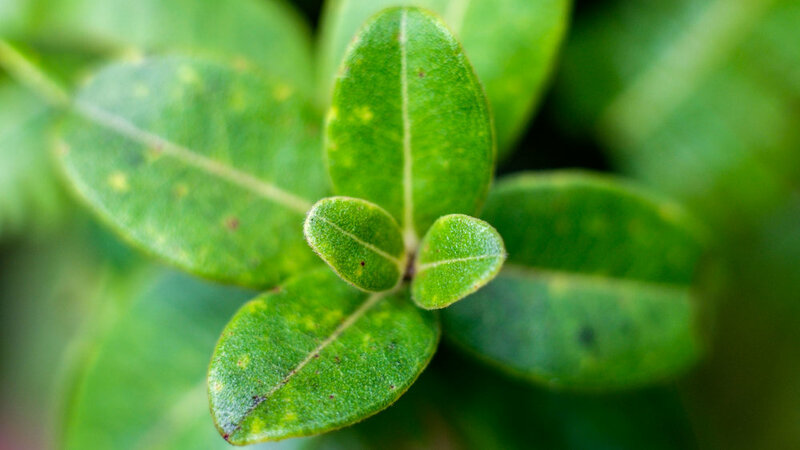 Protecting, preserving and respecting tradition, culture, and paying reverence to the islands gods is all part of the Hawai’ian experience, drawing on the spiritual energy called “mana” which is also present in humans, animals, plant life, oceans, and geologic features. Polynesian pioneers from South Pacific islands have been traveling to the islands of Hawai’i in double-hulled canoes for more than 1,500 years. Historically, they used the sun, moon, stars, winds, and patterns of bird flight to guide them. Once settled, native communities have flourished on the islands. It is near impossible to visit the Islands of Hawai’i without hearing of the legend of Pele – the Hawaiian goddess of nature’s greatest forces: fire, lightning, wind, and volcanoes. Legend goes that if you anger Pele, you will have bad fortune for all of eternity. 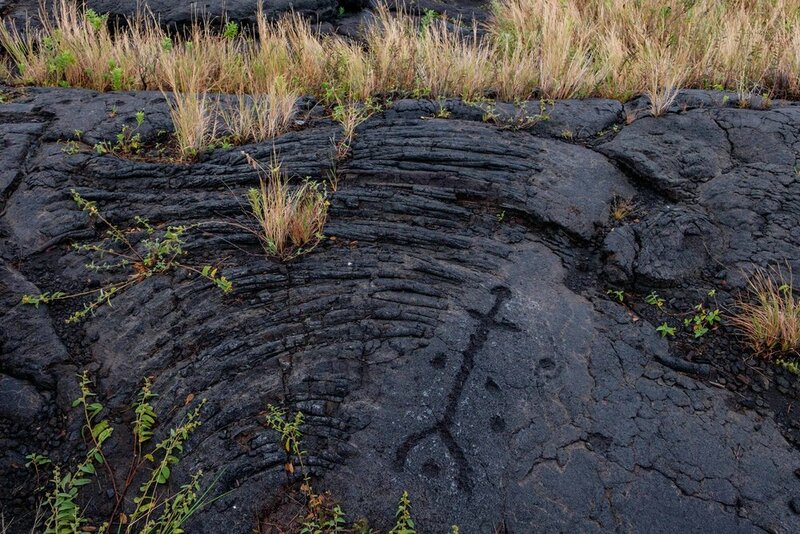 There are plenty of stories swirling through the area of how some whom have stolen lava from sacred lands have been stricken with terrible luck and have gone to great lengths to return relics to the islands. The rugged and forbidding lava-covered lands of Pele's Big Island are said to have been the last on the islands of Hawai’i to be settled on. Unlike Washington, however, Kamehameha the man remains something of a mystery. Though the number of rival chiefs he defeated and the valleys and coastal villages where he pursued each campaign for weeks or months are legion, his reputation rests primarily on oral histories. Tourism ramped up in the park in the 1840s when local businessmen Benjamin Pitman and George Lycurgus developed and built several hotels on the volcanic rim. One of them was Volcano House, which remains the only accommodation/restaurant inside of the park boundaries today. It was built in 1877 and is listed on the National Register of Historic Places. Mark Twain once stayed at the Volcano House hotel overlooking Halemaumau Crater. 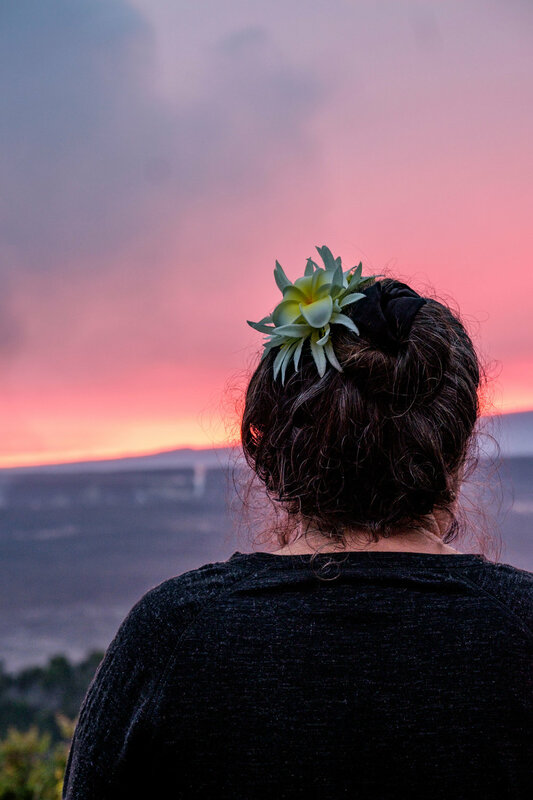 The Volcano House has 10 camper cabins just a short drive from the lodge at the Nāmakanipaio Campground, where you can have a campfire, cook out, and sleep in a dry cabin nestled in the Hawai'ian jungle. It's a more rugged, less costly, yet equally awesome park experience. Want to take a step back into history through the recollections of other travelers? The Volcano House Registers has captured 57 years of visitors' experiences in the form of drawings, anecdotes, poems, and other writings that encapsulate their experiences at the historic park dwelling. Digitization of the volumes was made possible through a cooperation of the National Park Service and staff from the University of Hawaii at Hilo Geology Department and are held by the Hawai'i Volcanoes National Park Archives. Teamwork makes the dream work! Speaking of geology... there are both black sand, and also green sand beaches in the national park. 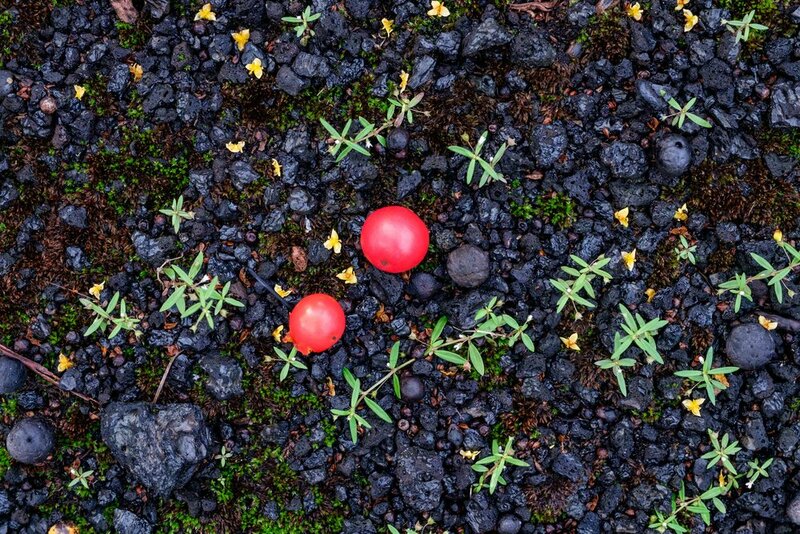 Their unusual color signifies the reworking of fresh lava by the erosional forces of tides, waves, and currents. There are more than 150 miles of hiking trails in Volcanoes. Snowfall occurs on occasion in some areas of the national park, most notably, atop Mauna Kea (13,803 feet), which is adorned by glacier ice between 2.5 million and 11,700 years old. Volcanoes is home to the endangered Nēnē, the Hawaiian goose. The #1 cause of death of the rare bird is by automobile collision on park roads. Be sure to take care while driving on national park roads and may the Hawaiian goose flourish for eternity! Other wildlife seen in the park includes: birds found nowhere else on Earth, carnivorous caterpillars, the largest dragonfly in the United States, lava crickets, native bats, and serene endangered sea turtles that coast along the shores. The National Park Service puts on “BioBlitz” events each year in most of the national parks. 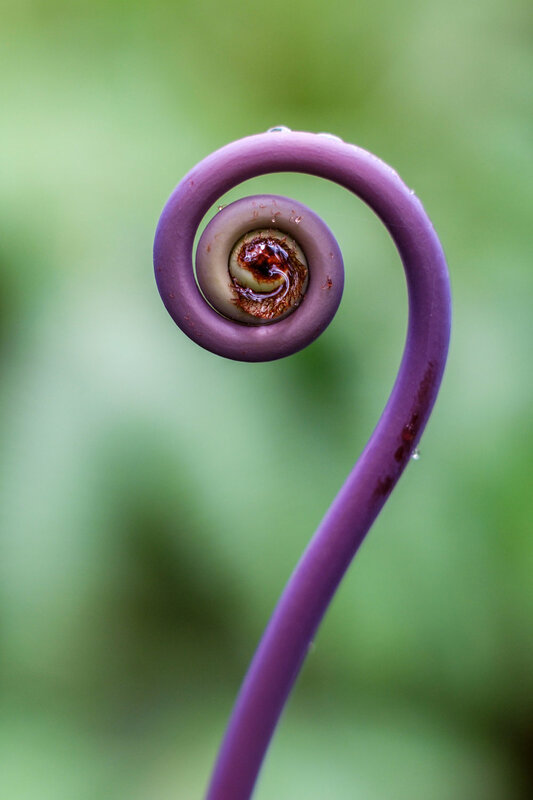 At Hawai‘i Volcanoes National Park, the Hawaiian Cultural Festival showcases authentic cultural demonstrations and engaging hands-on activities that highlight the special biodiversity in the park. The Nature Conservatory purchased 115,788 acres of land in 2004 expanding the park size by a third. 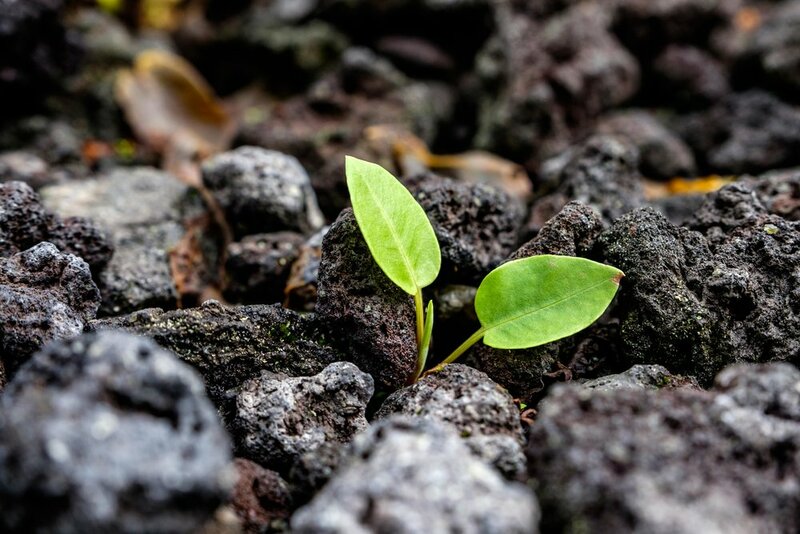 There are approximately 1,000 plant species in Volcanoes, 90% of which grow only there. Like several of the other national parks in America (Arches, Denali) the volcanoes found on the Big Island are commemorated on the 2012 America the Beautiful Quarters collection issued by the U.S. Mint. 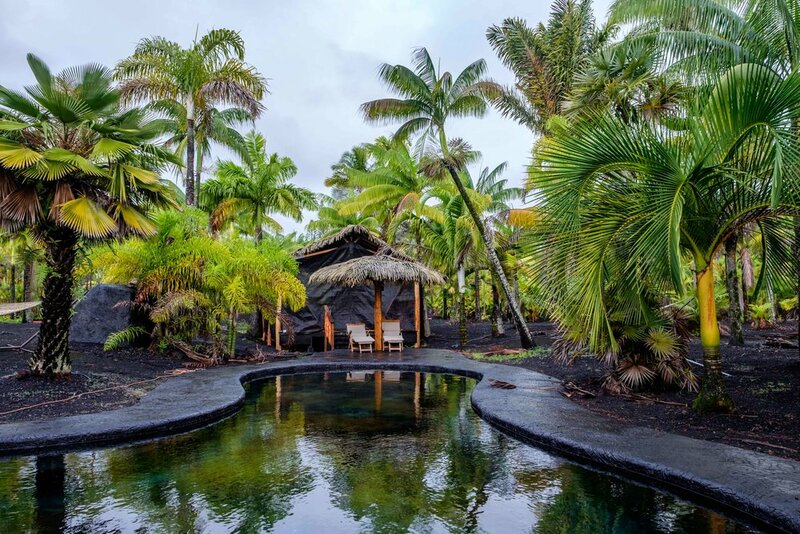 The Pu’uhonua o Honaunau National Historical Park is located 20 miles south of the Kona airport. While Volcanoes National Park is the only fully protected national park on the island of Hawai’i, there are three other protected National Historic Park Areas/Monuments on the Big Island including: Kaloko-Honokohau National Historic Park; Pu’ukohala Heiau National Historic Park; and Pu’uhonua o Honaunau National Historical Park, which we wrote separately about in the ‘Stops Along the Road’ section of this site. Check for park closures and advisories before heading out on your adventure. Volcanic activity can greatly effect accessibility to tourist sites. Nearly 2 million visitors traveled to Hawaii Volcanoes National Park during the centennial anniversary of the U.S. National Park Service. Jonathan Irish and Stefanie Payne at the Hawai'i Volcanoes National Park entrance sign. There are 13 letters in the Hawai’ian alphabet. To learn how to sound some of them out, consult this handy guide (pictured left), provided by the National Park Service! The word Aloha has several meanings. The most common is "hello" and "goodbye". It also embodies what is known as the "Aloha spirit" which transcends expressions of love and warm regards. The word Mahalo means "thank you."